During my outreach work for our office, I’ve had the pleasure of meeting a variety of different individuals of all ages and backgrounds. Having this hands on approach with the community has allowed me to answer those mental health questions that everyone wants to know, but does not know where to go, who to ask, or how to get started. The trending topic that I’ve experienced lately has been EMDR. Many of the questions that I’m approached with have all been the same…What is EMDR? What does it do? What’s involved? Etc. So I decided to sit down with Donna Lindley, a Licensed Marriage and Family Therapist from our office who is a certified EMDR Therapist to get the answers. A: EMDR International Association (EMDRIA) has defined EMDR as the following: Eye Movement Desensitization and Reprocessing therapy is an integrative psychotherapy approach that has been extensively researched and proven effective for the treatment of trauma. EMDR is a set of standardized protocols that incorporates elements from many different treatment approaches. In simpler terms, it is a type of therapy that uses eye movement, tapping, or auditory tone to reprocess trauma. It is very similar to the type of eye movement that our brain does in REM sleep. Q: What form of training and/or schooling is needed in order to practice EMDR? A: First and foremost, to practice EMDR you must be a licensed mental health professional. Some mental health professionals are (but not limited to) Licensed Marriage and Family Therapist, Licensed Clinical Social Workers, Licensed Professional Clinical Counselors, and Psychologist. Some Psychiatrists have also been known to use EMDR in treatment. Q: When is EMDR used in treatment? Symptoms? A: Initially EMDR was used to treat PTSD. (Posttraumatic stress disorder) However, over the years clinicians have been reported to use EMDR in treatment of depression, eating disorders, performance enhancement, stress reduction, panic attacks, addictions, pain disorders, sexual and or physical abuse. Q: What age can an individual start EMDR? Does age play a role in effectiveness in treatment? A: Age does not play a role in EMDR treatment. EMDR is appropriate for ages two years up. In fact, some may say that children are more open to EMDR as children appear more able to undergo rapid change. Q: How long must you treat a client with EMDR in order for them to feel or see results? A: This tends to vary and the process will occur differently for everyone. There is much to consider: the issues and factors involved, willingness of client, etc. And like other forms of therapy, building a relationship with your client is the first step. You should also be aware the first few sessions with your therapist are typically required for them to understand the nature of the problem and to decide whether EMDR is an appropriate form of treatment. Q: What do you feel are some misconceptions about EMDR? A: Some things that I’ve heard is: “EMDR is a new therapy and is not evidence based” OR “EMDR is too new to actually know that it really works”. As you can see there is some skepticism about EMDR, mostly because they do not understand it or how it works. However, many people are slowly changing their mind about how they feel about EMDR. Some reasons for this change are: EMDR is no longer a “new” form of treatment – In fact, EMDR has been around for over 20 years with the first studies beginning in 1989. 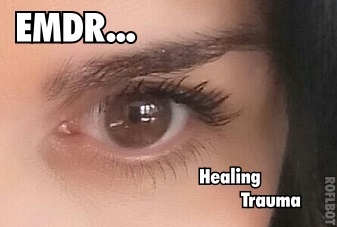 EMDR has essentially become one of the most well researched therapeutic modalities. Q: Is EMDR covered by healthcare insurances? Do I need a referral from my primary physician? A: Yes, EMDR is a well-known form of therapy and is recognized by most healthcare insurances. However, we always recommend contacting your healthcare insurance plan regarding your eligibility and benefits as well as obtaining more information about your coverage. Q: How long have you used EMDR in your practice? Q: How do I find an EMDR provider? A: At this time, Novell and Novell Counseling Services has three providers who practice EMDR. Jason Agnetti, LMFT, Elizabeth Erickson, LCSW and myself. (Donna Lindley, LMFT) You may also go to the EMDRIA website to find a therapist, as well as to obtain more information about EMDR. To schedule an appointment with Donna Lindley, LMFT, Jason Agnetti, LMFT, Elizabeth Erickson, LCSW or any of our therapists, please call 951-252-9911.